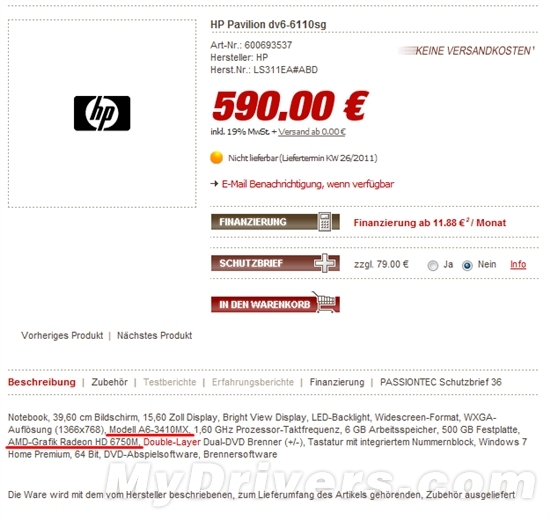 A German site has exposed HP’s upcoming notebook which would feature the A6-3410MX APU processor which is part of AMD’s Llano Fusion Mobile Lineup. Information chart detailing the Mobile versions of Llano chips has already been leaked which you can see here. The notebook with Product model “Pavilion DV6-6110SG” features the “A6-3410MX” APU (Accelerated Processing Unit) which is a Quad Core Unit has a stock core speed of 1.6Ghz with Turbo Core upto 2.3Ghz. The APU allows for DDR3 memory 1600mhz and Low Voltage DDR3 memory support with frequencies of 1333mhz and 4Mb of L2 Cache, Total TDp of the chip falls around 45W. Although the APU includes a Radeon HD 6520G HD embedded chip (320 Stream Processors @ 400mhz) but HP also included a Radeon HD 6750M Graphics solution with upto 480 Stream processors, Other specs include 15.6″ LED Backlit display with resolution support of 1366×768, 6GB DDR3 memory, 500GB hard drive, DVD burner, Windows 7 64 Digital Home Premium Edition operating system. The notebook is priced for 590 Euros and would be available in June-July 2011.